Some years ago, when I still owned my then 35-year-old Datsun GX 1200, we decided to drive to the Katse Dam in Lesotho. We had to turn back at the start of a steep pass as the car was struggling (it emerged it needed a new fuel pump) and sulked for weeks afterwards at being deprived of a little adventure. Sadly, it went to a vintage car dealer before it could ever again attempt that journey. But when someone told me a trip to the Katse Dam with Clive Craig, owner of Fouriesburg Country Tours, was like “attending a church without a minister”, I decided to sign up. Friends suggested this would be “too tame”. While many think a coach trip is the preserve of the old and doddery, such cynics are driving down the wrong side of the road. Here, for me, were just some of the advantages: a chance to take in all the magnificent scenery without concentrating on driving; fun, interesting companions with a wealth of experience behind them; knowledgeable tour guides; and – always a priority – delicious meals, without the effort of preparation. We spent four nights in the Fouriesburg Country Inn, doing day trips from there, so no packing and unpacking of bags, which added to the relaxed feeling. Fouriesburg Country Tours markets a series of trips leaving from KwaZulu-Natal (with pickups on the South Coast, Westville, Hillcrest, Pietermaritzburg and Howick) as well as ones beamed at residents of Gauteng. 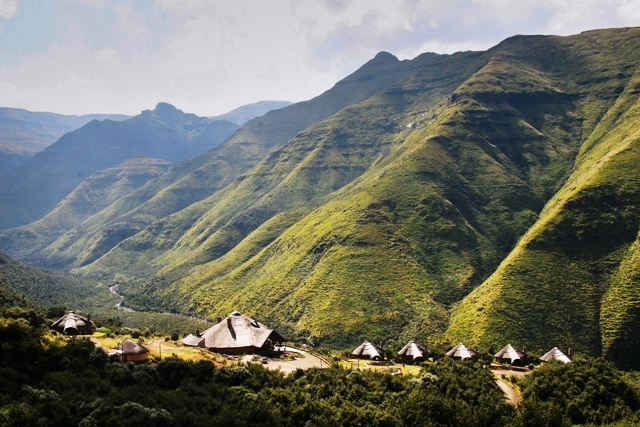 So climb aboard a coach bound for a five-day tour of the Eastern Free State and Lesotho. Having grown up in that area, I smugly felt there was little they would be able to tell me. Boy, was I in for a surprise. For instance, koppies I had seen a multitude of times suddenly had a name and a history – like Futane (meaning stench, because during the Basotho Wars the enemy was flung from this cliff and their inaccessible bodies left to rot in the crevices); Hoenderkop (Afrikaans for a hangover as traders of old often camped here, partied overnight and awoke to feel less than sober); Gladstone’s Nose (this politician’s notable feature). 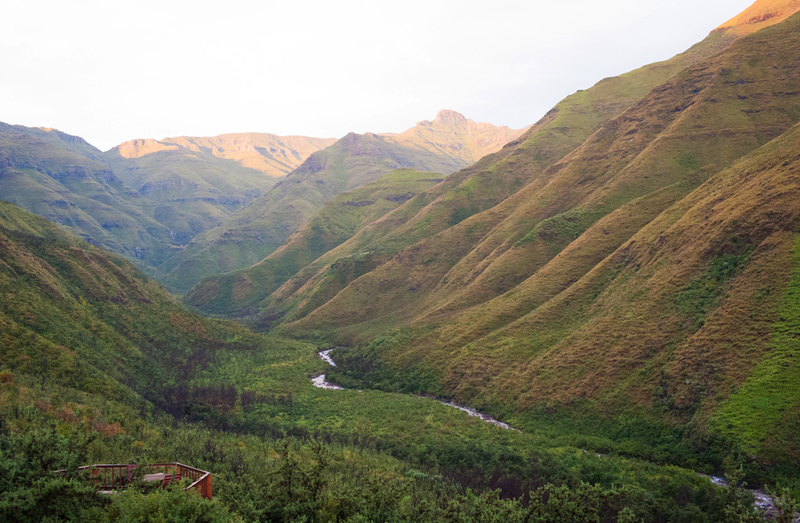 Lesotho is famous for its mountains, alpine flowers, adventure activities and the Katse Dam, so that was a highlight of the trip. On the day of the trip into Lesotho, guests were woken at 5 am and, armed with a breakfast pack, were at the border by opening time. We were glad to pass quickly through the lowlands (lots of trash in Butha Buthe) and head for the pristine highlands, where every village and homestead is beautifully kept with great pride. Days of torrential rain and low hanging cloud made for a different experience. While the top of the craggy 2 950m high Mafika Lisiu mountain pass was swathed in mist, obliterating some of the apparently fabulous scenery, instead there was the unique sight of dozens of crystal-clear waterfalls spilling their way down the steep mountainsides. 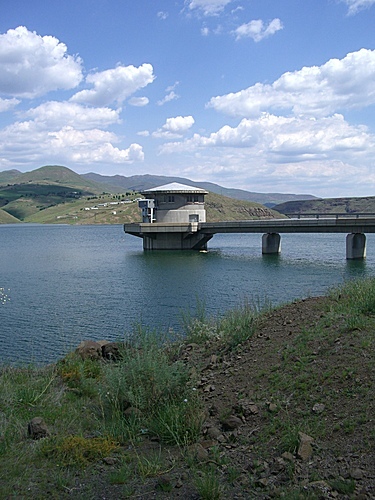 Much of this water finds its way into the Katse Dam, then via an intake tower, along an 82km tunnel under the mountains, into the Ash River near Clarens in the eastern Free State, and ultimately into the Vaal Dam (all by gravity, there are no pump stations) to feed Gauteng’s thirsty industry. 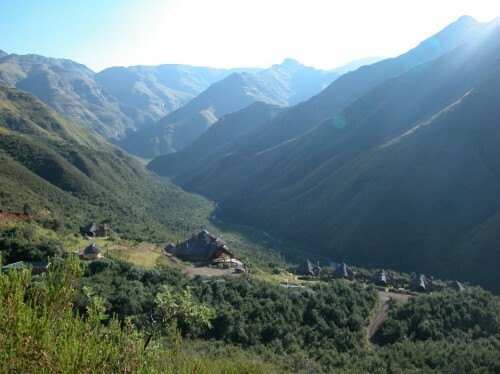 For this Lesotho receives millions of dollars each month from the Rand Water Board. Katse Dam – the highest in Africa – is about 50km long, narrow, very deep and winds its way through the rather stark, hilly landscape. 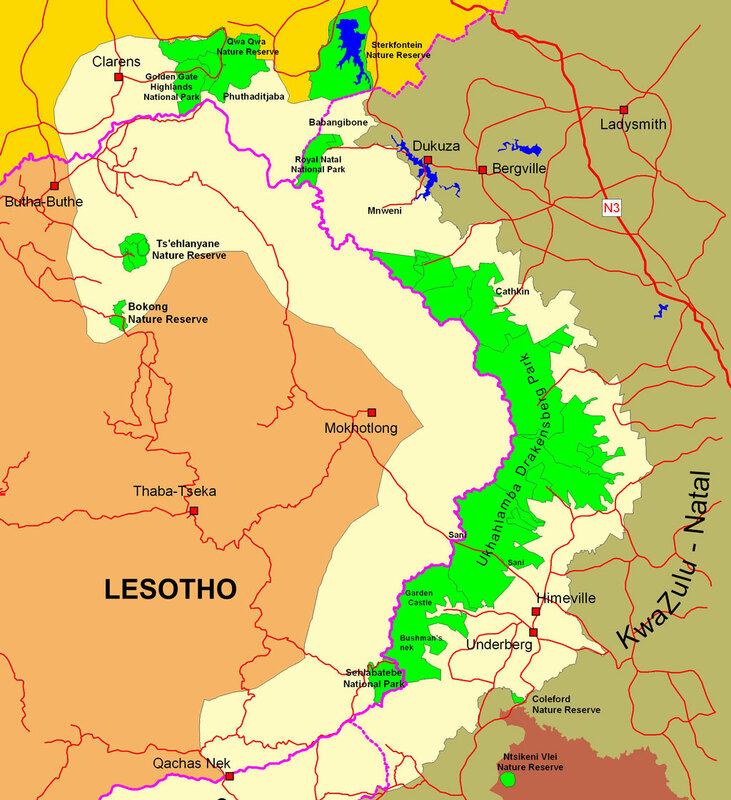 At its head lies Ha Lejohne, named by the Basotho for the British soldiers (Johnnies) stationed here when the country was still a British Protectorate. The dam wall is 185m high, and a walk inside this with one of the resident engineers unveils what a miracle of construction it is. The Orion Katse hotel, overlooking the dam, offers splendid views, accommodation and a tasty lunch for the hungry traveller. 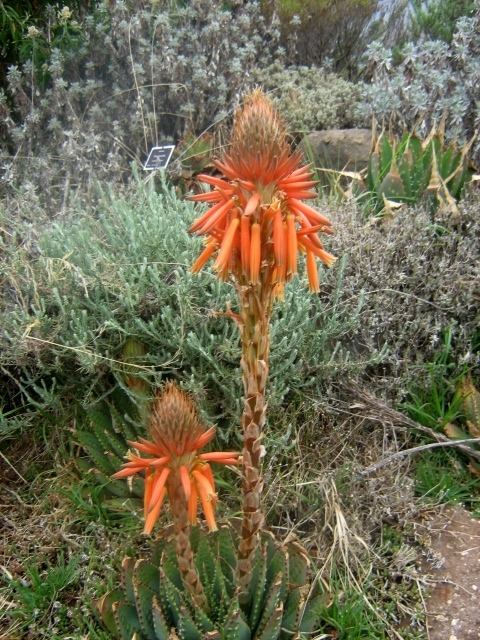 During the course of the journey, we were given much information on the country, its education system, the diamond mines and learnt that it was French missionaries who introduced the ubiquitous Basotho blanket, offering one to the king who draped it over his shoulder, thus making it a fashion craze among his subjects. Other days included a trip to Ben Nevis cherry farm outside Clocolan, where we got to taste cherry wines, liqueurs and other products. Also on the itinerary was a visit to the SH Pellissier Art Gallery, attached to the now amalgamated Ficksburg High and Technical Schools. Pellisier, a one-time school principal and founder of Volkspele – the typical Afrikaans dance form – befriended a powerful man who had a great interest in bushman rock art. This led to artist JH Pierneef (who was at that time an art master at a Heidelberg college) being invited to sketch a frieze and eight wall panels. These were not just a figment of the artist’s imagination – each reflected an actual painting on some remote cave wall. A teacher at the school gave an in-depth guided tour, explaining the background and also the fact that every matric class since 1922 has donated a painting to the school. The collection is thus a valuable and fascinating insight into various South African artists. The tour also visited All Saints Anglican Church in Vicksburg, home to a well-known collection of windows depicting the local flora and fauna in a tapestry of glass. A bit of fluff was next on the agenda – Mokoadi Angora Farm outside Clocolan, where we met one of the stars of the show, a beautiful bunny, and saw how women spin delicate items from its hair. Apparently, these are highly sought after by people from Europe for its purity, as many other countries mix the hair with cotton. On another day, guests spent time in arty Clarens and had lunch here before proceeding to the rocky splendour of the Golden Gate National Park, where at one lookout point one can see as far as the Devil’s Tooth at Natal National Park. Traditional, home-cooked meals were in abundance, along with a sumptuous spitbraai. The Fouriesburg Country Inn has great charm, and is typical of country hotels of yesteryear, but with all the modern comforts. The owners of Fouriesburg Country Tours, Clive and Martie Craig, along with their son Johann, have been in the industry since 1995, and offer a variety of trips in South Africa, Namibia and Botswana. While guests are predominantly older, younger people often sign up. The coaches used are luxurious and our driver was a dream, safe and steady behind the wheel. My bags are already packed for another venture.